Mormy.net is my personal site that I use as a tech blog with articles and tutorials on various tech gadgets, programs and applications that I find useful or interesting. 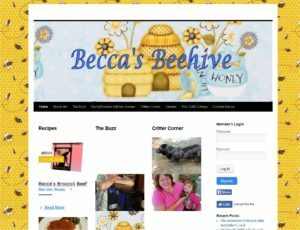 Beccasbeehive.com is my girlfriends site that I helped her get started with. It is a personal blog site that also makes use of a recipe plugin and a member login to allow multiple users to submit articles and post comments.